Daniel Sousa: [Peggy is interrogating a suspect about the Arena Club] What did you stick him with? Peggy Carter: Howard wanted to create a cure for the common cold. He came up with a compound that brings on intense symptoms in minutes. Daniel Sousa: You gave him a cold? Peggy Carter: An intense cold. Rufus: [in pain, off screen] Hey! Peggy Carter: [nonchalantly] Cup of tea? 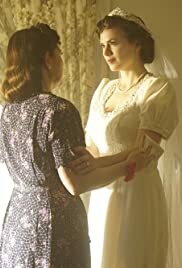 The origin story of Margaret Elizabeth Carter, shown in this episode, helped bolster my love for her character as well as the performance by Atwell. It wasn't just the flashbacks that did it as the interrogation scene with Hunt was also very intimidating yet fun. We see through Carter's early life that she was always one to go against gender norms in the early 20th century. It was also interesting to see that Cap wasn't her first love and what happened to her after her brother died. Truly great range of emotions shown through Atwell's performance in this episode. We also got an insight into Whitney Frost/Agnes Cully's backstory. WE see that she too was trying to break through gender norms of the time with her intelligence. While she is undoubtedly a genius, she is still a woman, which her mother told her that she needs to focus on her looks, not her brains. While she did do this with her acting career, she was smart enough to do both. Even better for Whitney this episode was her trying to control the zero matter that had joined her. The end with her absorption of Hunt was truly incredible as it was disturbing to hear a man be melted from existence. With this unknown power now somehow controlled by Whitney, she truly is becoming a more formidable force. I loved Jarvis this episode and the humor he brought along with it. His tranq gun used to bring down Stark's koala was pretty funny. He was also hilarious in his tranqed up stupor.